1. Sleep, knitting, reading, blogging. These, in no particular order, are the things I consider essential to being me. Too much time spent without any of these makes me feel, well, not just not myself – but less than a real person. Just a zombie, a mombot, going through the motions. Of course, time does not allow for me to actually get all of these on a regular basis, so apparently, without planning it, I’ve been rotating. Recently has been the reading+knitting cycle. Sleeping and blogging, not so much. But the reading and knitting were really overdue, and I feel much better now. 2. Elfling starts kindergarten on Monday. Which means WE SURVIVED THE SUMMER. Which is beyond amazing. 3. Two weeks later, I start my new job. There have been some twists in that tale, but for now, the salient points are that (a) I get to be Editor-in-chief, a job title I really didn’t expect (and not what I applied for, insofar as I applied for anything in particular) and am not quite qualified for, but it’s rather a nice thing to put on my CV; and (b) owing to certain uncertainties in the general state of wossname (nothing to do with me personally), the job may not exist for very long, at all – which kind of means I can’t fail. All in all this is the least pressure I can imagine having in starting any job, ever (can’t fail; can’t lose anything because not working to start with; can only learn and have fun), and it’s pretty great that I get to enjoy this absence of pressure when trying out as The Editor. Fancypants title, that. 4. Going into town, which I do rarely but with great enjoyment, is always a little bit bittersweet. On one hand: I really love this city, and getting out there is pure joy. On the other: being in town with pram and Elfling in tow is not exactly the same as being there unencumbered. It fills me with thoughts of how much I’d love to be working in the city (Job is, alas, in Schlieren; not Zurich, and not remotely pretty or interesting), or hanging out there with Armin but without chilluns. 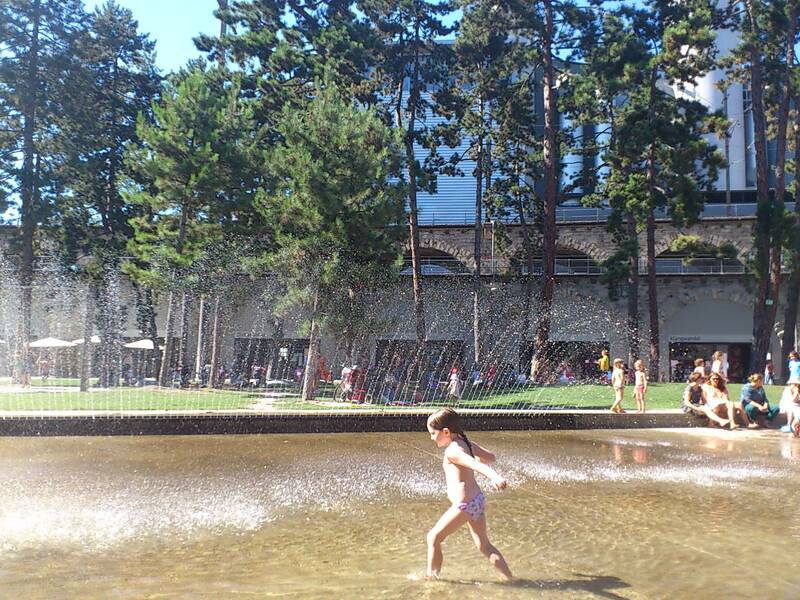 Turns out, moving to a new city with small kids is sort of a little bit HUGELY FRUSTRATING. I mean, today quite by accident I stumbled across the hip, up-and-coming, organic-coffee-drinking type quarter of Zurich, which I had no idea was there (or anywhere). It’s so very happening, so now, that (as I later heard) Swiss TV devoted a whole 12-HOUR LIVE FEED to one night there. * Ooh! So happening! So fun! So hard to enjoy when you have two rugrats and an accordingly tight budget! Although this particular hip quarter is hip enough to have a very family-friendly little park, with playground, splash pool and overpriced organic cafe. So there’s that. 5. 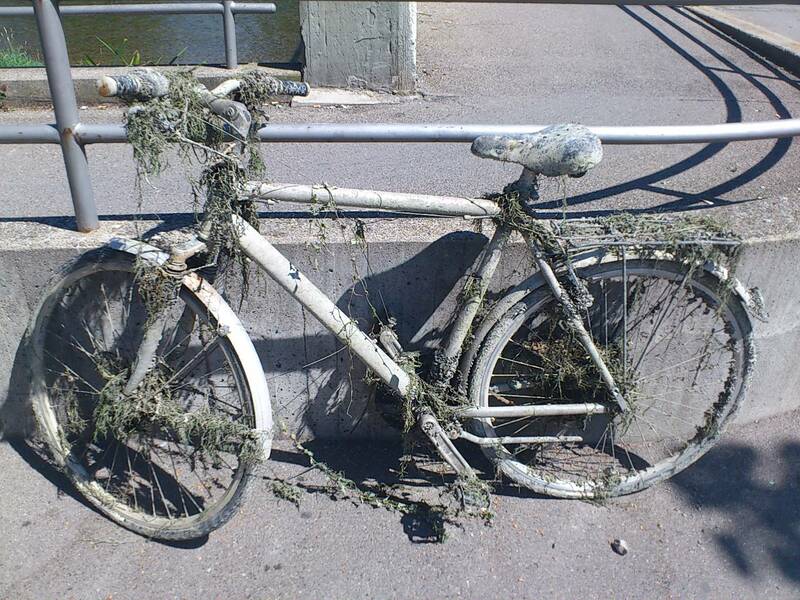 Speaking of fun things found in Zurich: somewhere a fish has lost its bicycle. * One has to admit that this does nothing to fight the image of Zurich as a boring city. I mean. A little regeneration and suddenly there’s a 12-hour live feed? Of… some people going to a few bars in a quite nice viaduct? Um, yay Zurich?